May 12th, 1940, near Hannut, Belgium. 4th Panzer Divisions is tasked with securing the flank of 6th Army by taking the area around Hannut while the French Brigades Légères Mécaniques counterattacked and one of the biggest tank battles of the early war was on. 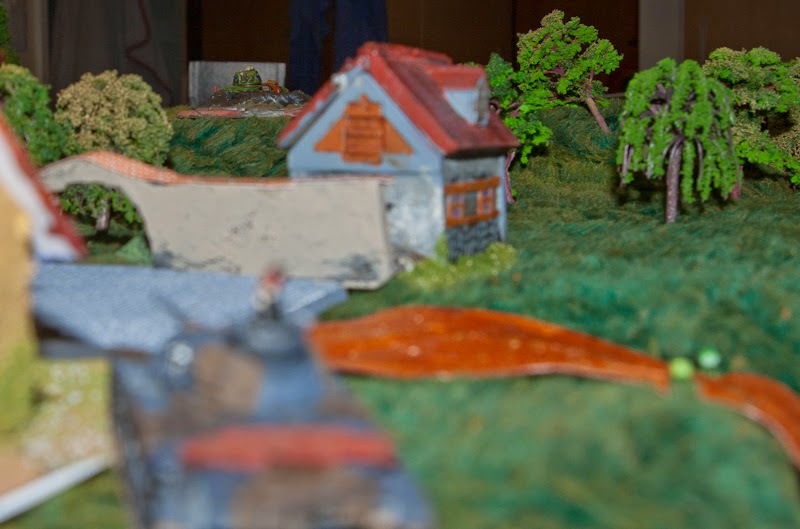 This is a fictional scenario near the village of Dieu le Garde, just south of Hannut. 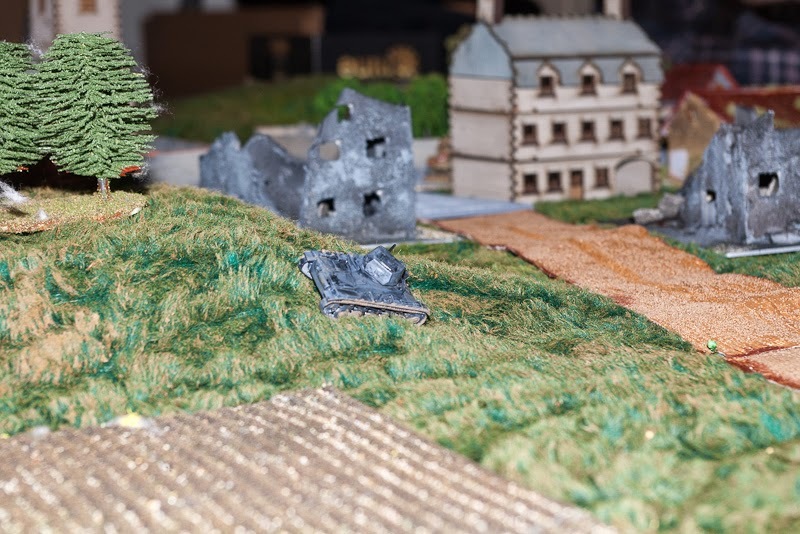 A small German panzer force of 2 depleted platoons is pushing forwards, while French Somuas supported by recon armored cars counterattacks them to secure the village. Germans had 3*PzIII and 4*PzII in 2 platoons with full radion networks while the French had 4*Somua and 3*Panhard AC in 2 platoons with no platoon radios. 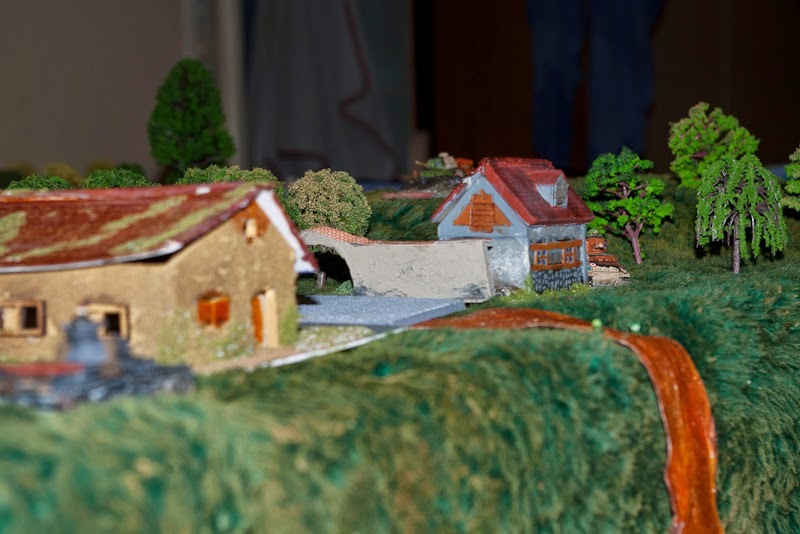 The German plan was simple: French would likely commit his armored cars to the village proper using their superior road speed, while the slower Somuas would likely support from back and take the leftmost hill overseeing the fields. It was highly likely that neither the PzIII nor PzII could go toe to toe against Somuas, so half of the PzII would either try to slow down the advance on left flank, or situation permitting flank the Somuas using the hills and woods. Meanwhile PzIIIs would bottle in the Panhards and rest of PzII would hit them in the flank. Things don't alway go according to the plan. Brown circles are hills, blue lines German advance and red lines estimated French axis of attack. This did not work completely according to the plan, as the enemy was not in the expected place and French gunnery was much better than expected. The leading PzIII went on overwatch to cover the entrance to the village and was promptly KO'd by the first shot from French Somuas. The second PzIII was a tad more cautious, inched to a hull down position on the central hill and immediately received a penetration through the gun mantel, losing the main gun. Not the best possible start to the attack. It was also clear that enemy was committing the Somuas to the village and using Panhards to screen their flank - so it was 4 Somuas against a lone PzIII in the village and 4 light panzers against 3 almost equally heavy Panhards on the flank. French show their hand almost immediately. So much for showing only the turret..
Achtung, enemy panzer straight ahead, distance 100, fire! 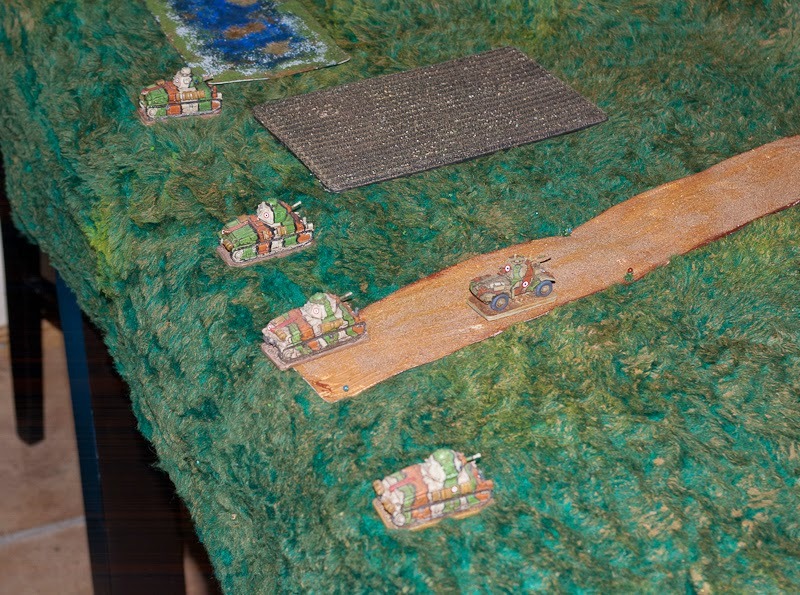 On the left flank the leading PzII and Panhard fired almost simultaneously, both losing their drivers to first hits. Unfortunately for the Panhard, rest of PzII did not stand idle but forced the crew to abandon their well-ventilated armored car. 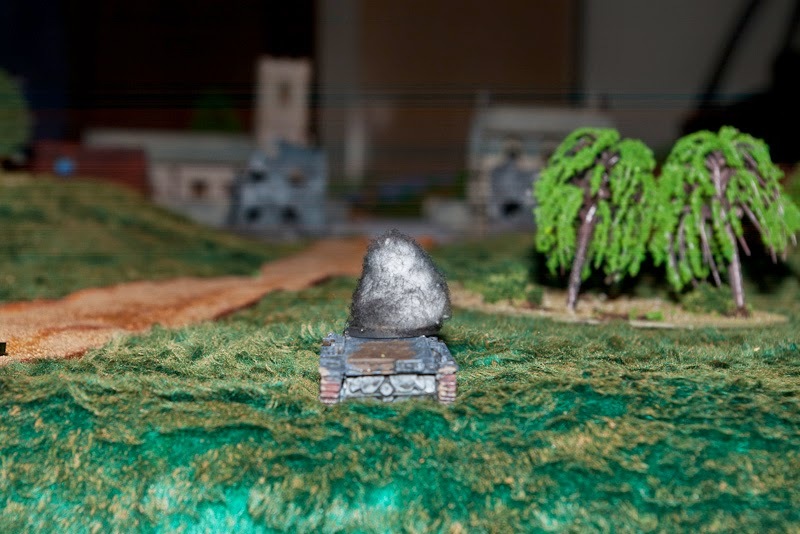 Meanwhile the proud chevalier commanding the Somua platoon decided to take a shortcut through the cemetery, only to have his tank throw a track while crossing the heavy stone wall. Situation was still favoring the French, but getting more balanced. 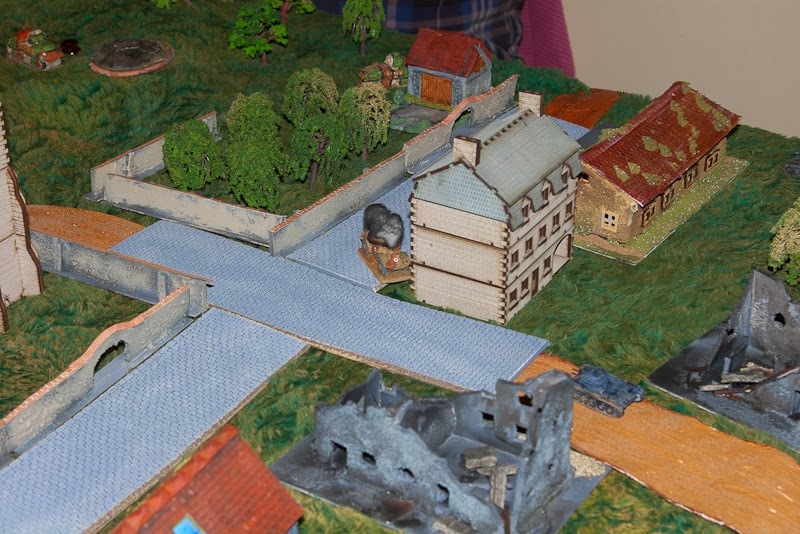 Germans switching their attention to the village, fight will be decided there in the knife fighting range. Wall was tougher than expected. 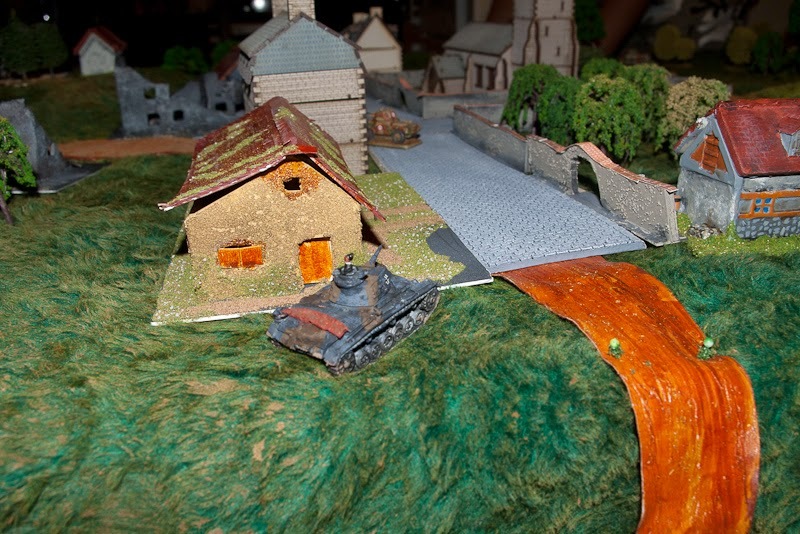 One of the Panhards decided to scout the village for the heavies and parked in good cover by the main crossing, exchanging ineffectual fire with PzII hull down by the central hill. Unfortunately, the lone remaining PzIII with platoon leader was flanking him. 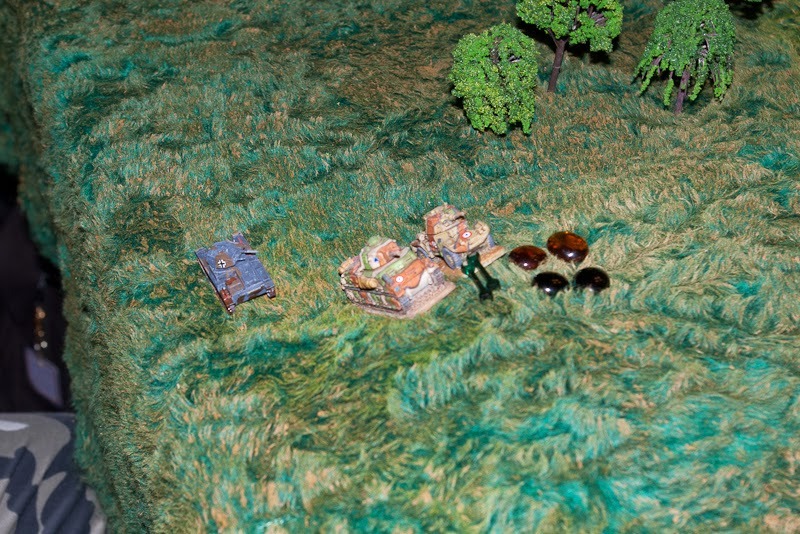 The poor Panhard was momentarily saved, as the lead Somua climbed the rightmost hill to start a duel with his German adversary and the AC platoon leader inched forwards to make sure that the PzII on the left flank would stay put. Meanwhile behind the poor Panhard, hunter is approaching. And yet another hunter arrives, French mad minute starts. This started the French mad minute, during which they pumped endless amount of rounds towards the Germans (both French players got 2 phases and then 3*6 ended the turn, giving them one more phase.). Unfortunately for them, Somua was unable to score a single hit while the Panhards scored multiple hits with no penetrations. After this the Germans coolly opened fire, PzIII putting a round through the Somuas cupola, wounding the commander while the leftmost PzII knocked the Panhard platoon leader out - French morale took a big hit and initiative switched to the Germans. French tried to plug the gap with another Somua climbing the hill and shocking the PzIII into withdrawal by wounding the commander. 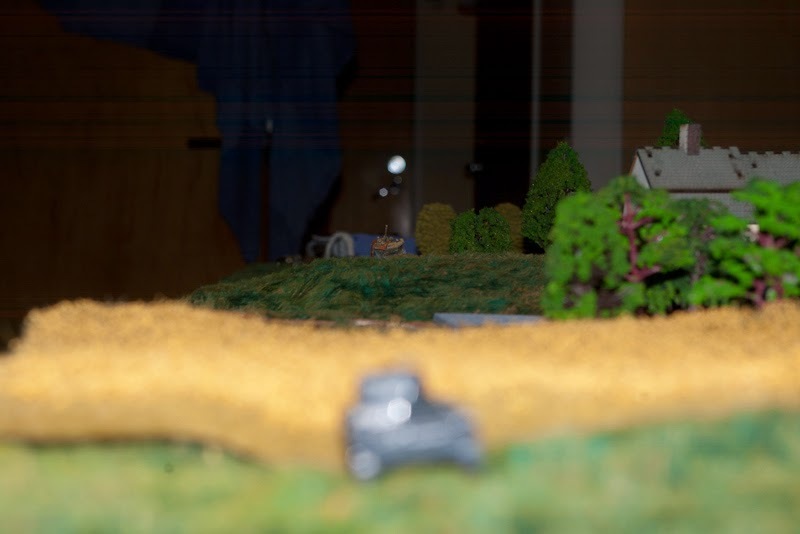 They were unfortunately not able to capitalize on this, as the lone remaining Panhard went up in a ball of fire after a flanking move from the leading PzII. 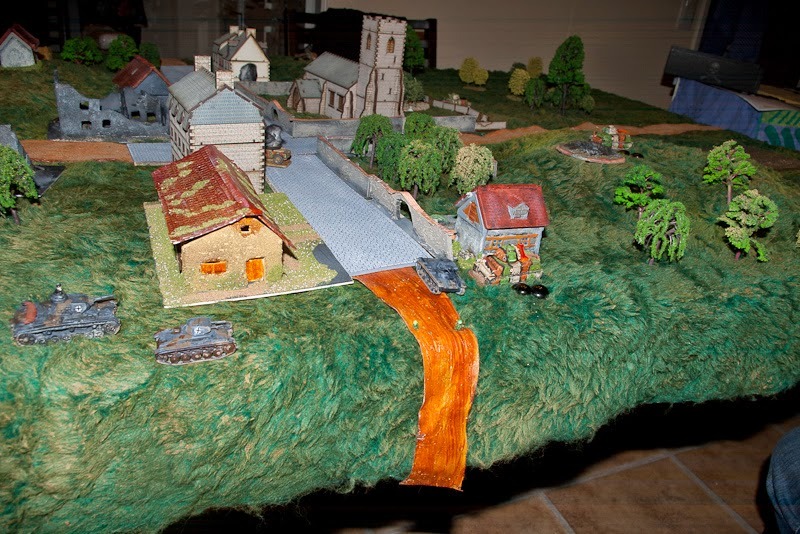 Last 2 intact French tanks went into attack, on the German left by taking hull down on the hill, threatening the lightly armored PzII while on the right it was tank against tank in the village. At this point the advantage from German radio network was apparent, as the lighter PzII moved with great coordination. The driverless one took the hull down Somua under fire - well knowing that he would lose, but giving platoon mate time for a flanking maneuver and the 2 near the village moved in to support their heavier friend. Again the French gunnery failed, with both PzII and III remaining intact, while the Somua on the right was immobilized and the PzII that flanked it knocked out the one on the left. Somua platoon leader could do exactly nothing when all the enemies made absolutely sure not to show themselves to him. After this it was just the formalities, as all French tanks could be flanked from both sides. 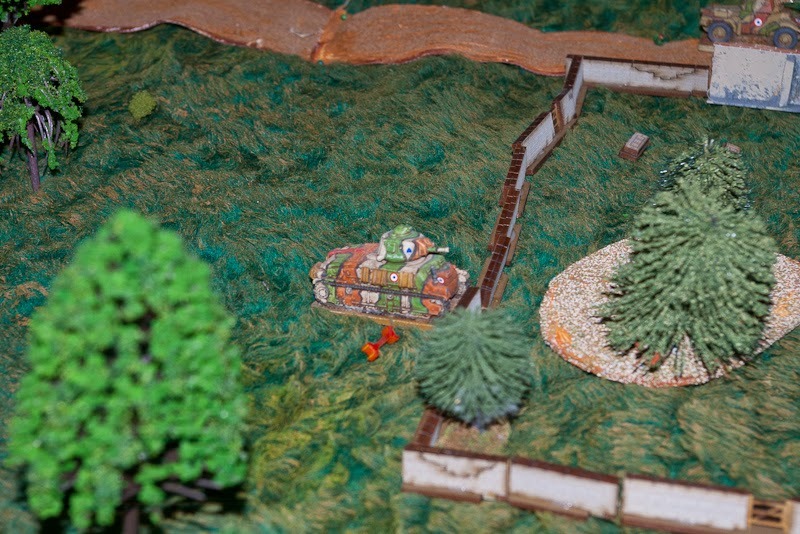 PzII bounds from cover to cover and flanks the heavier French tank. While the Panhard in the village brews up. In the background, heavier tanks play hide and seek. Almost embarassing flanking manouver, fortunately the Somua was not able to activate next phase. 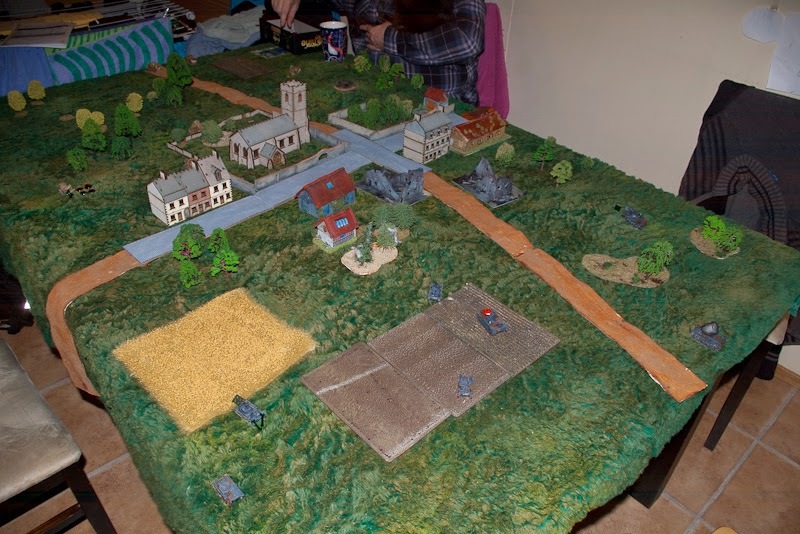 Our first big CoC game, with 2 armored platoons per side. 2 players on the French side, 1 on German. 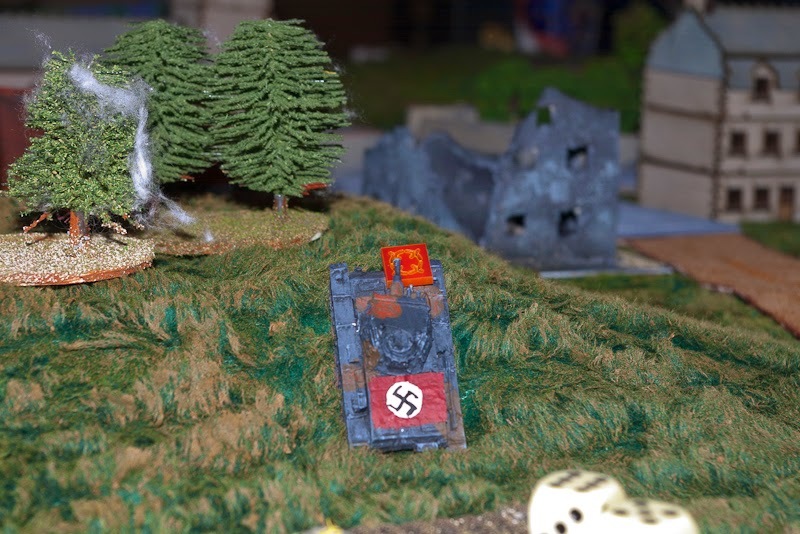 The initial phases were a disaster for the German player (pure stupidity and underestimating the French guns) after which the god of dice decided that the French had had enough and abandoned them. First the Somua platoon could not get the necessary die combinations to activate much anything (1,1,4,4,6 is particularly useless when you radioless SL is stuck in the church wall.) and then they could not do any damage - multiple shots with 2d6 against 4 or 6 and no effect. The radio net allowing the German to keep at least most of the PzII active every phase was a great asset, as it allowed the German player to quickly shift the focus first to the left flank and center and afterwards to flank the lone Somuas. This played pretty much the same way as the memoirs from the period read - French tanks were not used massed but alone and while their armor and weapons were superior in any one on one engagement, they slowly succumbed to flank attacks and unfair numbers. A great game all in all, many nail biters and showed how much fun big CoC can be - tank action has also very different feel to your normal infantry combat, with quick shifts of focus and jockeying for keyhole positions.